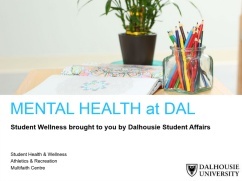 As of September 5, 2017 Dalhousie Student Health Services, Counselling & Psychological Services, and Student Health Promotion are integrating their services and programs to better serve students as Dalhousie Student Health & Wellness. Why is Dalhousie changing their services? Dalhousie is adopting a research and evidence informed approach to health & wellness services, an interprofessional collaborative healthcare model that better addresses student needs and increases access to same-day professional healthcare, including mental health services. For more information about the approach and model, contact Verity Turpin, AVP Student Affairs. What happened to Counselling & Psychological Services? Our dedicated team of counsellors are still located on the 2nd Floor of LeMarchant Place; however, the team has integrated their services with Dalhousie Student Health Services and Student Health Promotion to better serve students as Dalhousie Student Health & Wellness. This change was made to provide increased access to mental health services through one centralized location and adopt an interprofessional collaborative healthcare approach. How does integrating services provide increased access to mental health services? Having one centralized location for primary and mental health services will help promote general access to care while also reducing any potential stigma associated with accessing mental health care. By implementing an interprofessional collaborative healthcare model we will also be using a stepped care approach and enhancing existing collaboration between our healthcare providers, which will allow for the increased ability to meet both the physical and mental health needs of our students. Stepped care is the process of identifying an action, resource or service that addresses the students’ needs best. If that action, resource or service does not meet the students’ needs, they are reassessed and a new action, resource or service is identified as the next step, and so on until their needs are met. How do students access medical and counselling services? Students can access the Student Health & Wellness Centre and be seen by a physician (walk-in, same day, or at a later date) or walk-in counsellor. Students who see a walk-in counsellor will be assessed and leave their appointment with a co-created wellness plan. A student wellness plan includes recommended actions, resources and/or services to help the student reach their wellness goals (can include healthy behaviours, online resources, referrals to other offices, and/or specialist referrals, including to see a counsellor for ongoing therapy). How do students access career counselling? Dalhousie’s Career Counsellor can be accessed through the new and enhanced Student Success Centre: Academic Advising & Career Services, located on the 4th floor of the Student Union Building. Students do not need to go to walk-in counselling and receive a referral, and can make an appointment by calling 902-494-3537. How do students access our learning disability counsellor? Students who are looking to be screened for a learning disability or receive learning disability counselling must first see a walk-in counsellor at the Student Health & Wellness Centre. After being assessed, students may be referred to our Learning Disability Counsellor, who will reach out to them to make their first appointment. Can students make an appointment with a personal counsellor? Students can access same-day walk-in counselling services at the Student Health & Wellness Centre. Students who are assessed as requiring additional counselling services will be referred to a counsellor, and may receive ongoing therapy. Ongoing therapy usually consists of 4-6 sessions. Students who are currently under the care of a counsellor can continue to book appointments directly with their counsellor (see additional details below). Students can also have direct access to registered psychologists in the community through the benefits in their DSU health plans. The DSU Health & Dental Plan has 100% registered psychologist coverage, up to $1000, and international students have additional coverage through the DSU International Student Health Plan. For more information, students can visit www.studentvip.ca/dsu or internationalhealth.ca/dsu. For support in getting connected to community resources, students can make an appointment with our social worker through the Student Health & Wellness Centre. Can students make an appointment with a psychiatrist? No. Students can access the Student Health & Wellness Centre and be seen by a physician (walk-in, same-day, or at a later date) to be assessed. After being assessed, students may be referred to our psychiatrist. Students can also benefit from shared health records, an additional aspect of an interprofessional collaborative healthcare approach. On the student’s intake form, if they consent to shared health records, our physicians can collaborate with our psychiatrist about the student’s care without the student making multiple appointments. What does “shared health records” mean? When students fill out their intake form, they will be asked if they consent to shared health records. With consent, shared health records means that student health records can be accessed by our healthcare providers, including our physicians and counsellors, in the event that a student’s needs can be better addressed by collaborative care. Students who only wish to share certain parts of their health record, or who wish not to share their health record, can indicate this on their intake form. Can a student book an appointment directly with our social worker? Yes. Students can make an appointment with our social worker by calling the Student Health & Wellness Centre at 902-494-2171. Our social worker also hosts drop-in hours around campus. What happens to students already seeing a counsellor? Students who are currently under the care of a counsellor will continue to book appointments directly with their counsellor. Students DO NOT need to be re-assessed through walk-in counselling. When returning students have their first appointment with their counsellor in 2017-18, they will complete a new intake form that asks for their consent to shared health records as part of the new interprofessional collaborative healthcare model. What happened to Student Health Promotion? Dalhousie Student Health & Wellness is integrating health promotion expertise into the interprofessional team. Student Health & Wellness will also continue to include a student team that will lead health promotion activities and programs, focusing on our three strategic priorities: mental health, sexual health, and alcohol harm reduction. Faculty & Staff: I’m concerned about a student. Where do I refer them now? If you are concerned about a student, you can tell them to go to the Student Health & Wellness Centre to see a physician or walk-in counsellor, or use our online form at dal.ca/livewell (coming soon!) to refer them to the Student Health & Wellness team. Online student referrals are managed by Dalhousie’s Case Manager (our social worker), who reaches out to the referred student to determine next steps to ensure their health needs are met.